Do you have a little reader? And by that I mean either an adorable Little Reader chair from P’kolino or a budding bibliophile? Either one will pair nicely with the newest P’kolino addition, the Little Sofa. 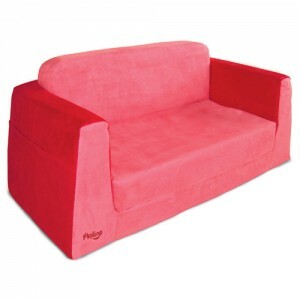 Available in two-toned green or red microfiber, the dense foam Little Sofa offers kids age 2-6+ a great place to cozy up with their latest library find or page through a hand-me-down classic. I love the wide base that keeps the foam sofa sturdy and stable, but at 5.5 lbs. the Little Sofa is still easy enough for my 3-year-old to move it around his room to find that perfect reading spot. The Little Sofa comfortably lets two tots sit side by side, and a book pocket on either side keeps their favorite books safe and separate. Even better? 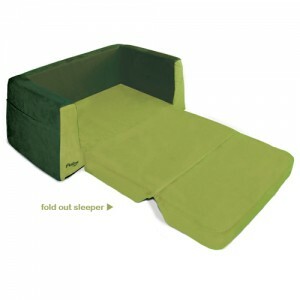 The Little Sofa folders out into a sleeper! Perfect for an impromptu nap or a friend’s overnight. My two boys love sitting side by side reading books, laying on their bellies playing with dinosaurs or taking turns folding up the sofa on themselves in a modified hide-and-seek game. I’m a fan of the Little Sofa’s compact size, how easy it is to move from room to room and the stain-resistant microfiber. Visit P’kolino’s website to learn more about the Little Sofa or if you’re short on space, check out their original Little Reader chair. MÃ¶chte mir eine neue Couch kaufen, weils meine alte einfach nicht mehr lange macht. Der Bezug des neue Sofas sollte ein bisschen was aushalten, da ich eine kleine Katze habe die des Ã¶fteren mal Ã¼ber das Sofa herfÃ¤llt und ihre Krallen schÃ¤rft. Nun hoffe ich das mir hier im Forum jemand weiterhelfen kann, denn ich habe keinen Plan welche Art von Material ich nehmen soll.